The Commons is available to tour 7 days/week. Please call for an appointment. At The Commons at Elk Grove, residents enjoy private, spacious studio, one and two-bedroom suites surrounded by their own furniture and personal treasures. A place to call their own. Our residents also find an array of choices to stay physically and mentally challenged. Enriching social programs provide a full spectrum of educational and cultural opportunities focusing on individual needs and interests. All this while still providing the professionally supervised personal care assistance that they require. Conveniently located in Elk Grove, residents can take advantage of nearby shopping, restaurants, medical facilities, and recreational opportunities. 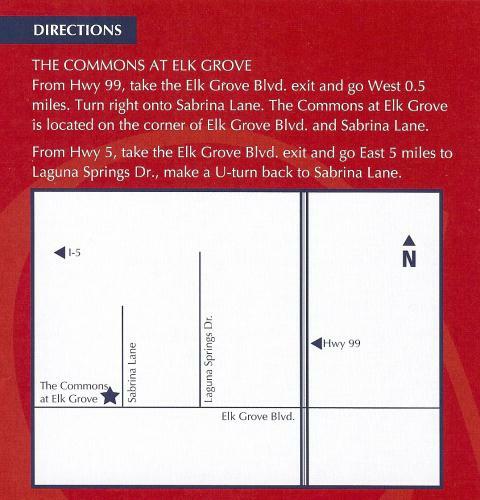 Cozy yet elegant surroundings, stimulating activites and excursions, exceptional amenities and extra help when needed - you'll find all this and more at....The Commons at Elk Grove. The Renaissance - Memory Care Apartments and Programming. Caregiver Support Groups for families of those suffering from Alzheimer's. 1/2 mile west of HWY 99 on Elk Grove Blvd.